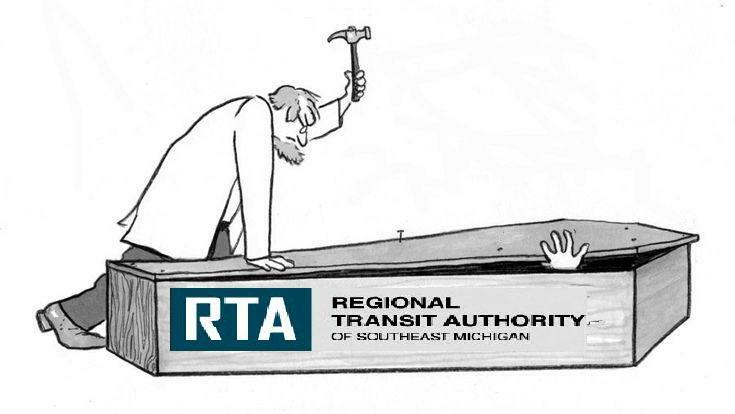 So as I’ve passed along to readers previously, the good people over at the RTA are desperate (and I mean literally desperate according to my sources), to get their shakedown on the November Ballot in order to provide some funding for their little “enterprise”. I’ll spare you the details on the previous foibles over the last two years regarding how they manage themselves, other to say that it looks like a Three-Ring Circus on steroids. Besides, I’m saving those for a little later in the year. In the meantime, let’s rewind to early 2018. Oakland County Executive L. Brooks Patterson comes out and tells mass transit acolytes that he cannot sign off on a plan that compels the people he represents to pay for something that they will not use. They are stunned. They are aghast. They thought that he had drank enough of the kool aid and was firmly onboard. Not that much later, Macomb County Mark Hackel comes out and opposes this ruse citing (correctly, IMHO) just how bad Michigan Roads are, and by extension Macomb County. Not only will you need to contend with Michigan Motorists more than a little peeved at the ROI from Gov. Snyder’s gas tax & license fee hikes (along with the willing republican state legislators…can‘t forget about them). Tax fatigue with the SMART renewal also coming up on the ballot later this year, isn’t exactly helping out the overall equation either. Did I mention that the RTA is essentially running with their old plan, albeit with a much higher tax and overall price tag now at $5.4-billion? Well, maybe. Read on. So the RTA, running out of cards to play, gets a number of so-called business “leaders” in Southeastern Michigan to sign off on a letter in support of the RTA. The contents of the letter made themselves look like fools given that they were a little vague on exactly what it was they were actually promoting. They also trotted out the worn-out “Amazon” argument on why we should pass a tax to pay for something that we don’t use. Curiously, those same “leaders” omitted the fact that Amazon chose several cities that DO NOT HAVE mass transit on their latest list like Raleigh, NC. And I certain that there were other very obvious reasons not stated. Still no moving of the numbers in your favor. People just aren’t warning up you your idea. Sweat is forming on your brow. Your palms are getting damp. You are not holding any real cards in your hand. Now you go for the “Hail Mary”, hoping and praying that you can win people over. At the Eight Mile Boulevard Association Leadership Luncheon last week, moderator Ron Fournier, who is now president of the Truscott-Rossman public relations firm, asked Macomb County Exec. Mark Hackel if race played a role in the failure of the previous RTA vote. .
Needless to say the Exec. Hackel cited the fact that if race was really a factor, then how was it that Macomb County was successfully shaken down to pay for things in the past like the Detroit Zoo and the previously mentioned SMART, which also runs into Detroit. The situation degenerated even more so when Oakland County Exec Patterson echoed Hackel’s comments. Take a wild guess where most of the monies collected from a RTA tax would flow from ? Hint: it ISN’T from Wayne County nor Detroit! Sensing an opportunity to make political headway, Wayne County Evans glommed onto the racism argument and even Detroit Mayor Duggan worked up the nerve calling Exec. Patterson a hypocrite for supporting the creation of the RTA legislation in the first place. Yes, sadly this is a tactic that has been used before (with limited success). It’s important to reiterate the fact that the race argument WAS NOT ORIGINALLY brought up by Mayor Duggan or Exec. Evans (who knew better), it was brought up by the head of one of the largest PR firms in Michigan (whose focus also includes government relations, community relations and ballot initiatives…just to name a few). I don’t have access to T-R’s client list, but is sounds very peculiar to say the least that someone who is MC’ing an event where the topic was workforce development, given the area’s history, going off the rails and throwing race into the discussion isn‘t exactly conducive to a productive meeting. One last note, just in case anyone is interested, the RTA claims that they still want to hear from you. There are scheduling a series of “community meetings” around the area, to gauge public reaction and fine-tune their proposal. Conveniently, they are all scheduled around bus routes and just when people are getting off of work. Thursday, April 26 — Detroit, 5:30-7:30 p.m., Detroit Historical Museum, Wrigley Hall and Booth Auditorium, 5401 Woodward Ave. I cannot imagine why they would do it that way? KG One please stay on top of this. It boggles our minds that property taxes are used to fund taxing authorities in the first place. On top of that, these ballot issues contain TIFF language, meaning that a tax for one thing is actually a tax to give to private entities our money to enrich themselves and it's most often NOT for public benefit. It's also nice to see that Brooks is a voice of reason here. And the race issue--have they not heard of the minority "privileged white"? This is the minority wherein the white privileged are allowed to work so as to fund the welfare system. Simply stated: NO NEW TAX! If all those assclowns want mass transit then let them pool their money together to pay for it.